With the recent drop in gasoline prices many people have begun to wonder exactly how close to historical lows we are? Back in 1918 gasoline was $0.25 a gallon and by 1932 prices had fallen to 18 cents a gallon! But as we all know over the last 100 years the purchasing power of the dollar has fallen drastically so in order to get the true picture we can’t just say that the lowest price of gas was 18 cents per gallon, we need to adjust the price for inflation. When adjusting for inflation there are two prices… the first is called the “nominal price” and that is the actual price you would have paid for gas at the pump. The key price though is the inflation adjusted price which calculates what the price would have been if were were spending current dollars on a specific date. In this case, we are basing our calculations on the value of a dollar in December 2015. In other words, imagine taking today’s dollars and jumping into a time traveling DeLorean and going back to a specific date in time. The inflation adjusted price (aka. the price in “real dollars”) is how much you would have to pay using the purchasing power of today’s shrinking dollar. If we look at the chart below we see that in inflation adjusted terms, the first low occurred in 1931 as nominal prices fell from 30 cents a gallon in 1920 to 17 cents in 1931. Thus in 11 years prices fell 43%. But we have to remember that 1931 was the beginning of the “Great Depression” and overall prices fell 24% during the same period. As we can see gasoline prices fell much more than prices in general in the early portion. It is interesting to note that in January 2016 prices for gasoline on an inflation adjusted basis are actually much lower than they were during the depression. During the remainder of the 1930’s inflation adjusted prices rose to the equivalent of $3.35 then they declined a bit. The rise in inflation adjusted prices is actually due to overall deflation making the adjusted price look higher even though the nominal price remained the same. And then in 1938 the nominal price rose to 20 cents a gallon and the inflation adjusted price hit $3.35 again. In 1940, nominal prices dipped back to 18 cents a gallon bringing the inflation adjusted price down to $3.04. From there the gasoline prices actually rose but inflation rose faster due to WWII so the inflation adjusted price of gas appeared to fall but due to war-time rationing gasoline was not always available. The next bottom occurred in 1947 as inflation adjusted prices had fallen to $2.44, with nominal prices back up to 1926 levels of 23 cents a gallon. By 1949, just two years later, nominal prices had climbed to 27 cents a gallon (a 17% increase) and inflation adjusted prices were $2.68/gal. From 1950 through 1959 nominal gas prices climbed from 27 cents a gallon to 30 cents a gallon with a brief stop at 31 cents a gallon in 1957. But over the same period overall inflation climbed faster so the inflation adjusted price actually fell from $2.65 in 1950 to $2.44 in 1959. From 1960 through 1965 nominal gas prices bounced between 30 and 31 cents a gallon while the inflation adjusted price fell from $2.48 to $2.33. But then the nominal price of gas started to climb and by 1970 had increased 20% to 36 cents a gallon but on an inflation adjusted basis gas prices had actually fallen to $2.19. And by 1972 gas on an inflation adjusted basis was a real bargain at $2.04 a gallon. At this point OPEC felt they were being cheated as the value of the dollars they were receiving were becoming worth less and less. So they started squeezing prices, which drove nominal prices in 1981 up to $1.35 and inflation adjusted prices up to $3.51. Note that this price was higher than the price during 1934 and 38 but below the 1918 price. From there nominal prices fell moderately over the next 17 years and inflation itself moderated falling from 13.5% in 1980 to 1.86% in 1986 and then increasing to 4.82% in 1989. This resulted in drastically cheaper gas on an inflation adjusted basis with the lowest recorded inflation adjusted price for gas occurring in 1998 at $1.48 per gallon. In 1998, overall price inflation made it look like gasoline prices were rising, so most people didn’t realize that gas was actually cheap on a historical basis. But they knew it intuitively since a smaller portion of their budget was going toward gasoline. In fact, gas had gotten really cheap by historical standards allowing people to buy gas guzzlers like SUV’s and Hummers. Note: Remember these are annual average prices for regular “conventional” motor fuel. Some states require “reformulated” fuel which would cost more. Some states also impose higher than average taxes on gasoline and so prices will be higher in those states. Also Mid-grade and Premium fuel will also cost more. Plus since these are “annual average” prices half of the year prices will be higher and half the year prices will be lower (sometimes with considerable variation over the 12 months). On an annual average inflation adjusted basis, gasoline prices have tended to peak in the same range over the entire 96 year price history. Back in 1918 as gasoline was just entering commercial production prices were at their peak at $3.92 but as refining capacity improved prices began to fall (in both nominal and inflation adjusted terms). In the early 1930’s demand for gas fell and so did prices but as overall deflation took hold the inflation adjusted price peaked at $3.31 in 1934 & 1938. The next peak occurred during the mid 1930’s and then there was a long period of relatively low gas prices so the rapid increase in the late 1970’s was a major (and somewhat artificial) shock to most people who saw nominal prices rocket above $1.00/gal. for the first time ever. Most did not realize that on an inflation adjusted basis the last time prices were this high was during the Great Depression (not that the thought would have brought much comfort). Over the next 20 years people in the United States, once again got used to low gasoline prices. And then from 2002 to 2008 prices for gas once again climbed to previous peak levels on an inflation adjusted basis. From there the stock market crash brought some relief in gas prices as virtually everything fell in price. But relief did not last long and by 2012 gas prices were once again at peak levels. In late 2014, OPEC started a “price war” and prices have fallen drastically since then putting short-term prices very near 1972 lows and below 1947 and 1931 lows. If the average for the entire year stays at these levels we could see a new low on the chart. On the other hand, if prices return to previous levels at the next OPEC meeting the chart may only show a small dip. 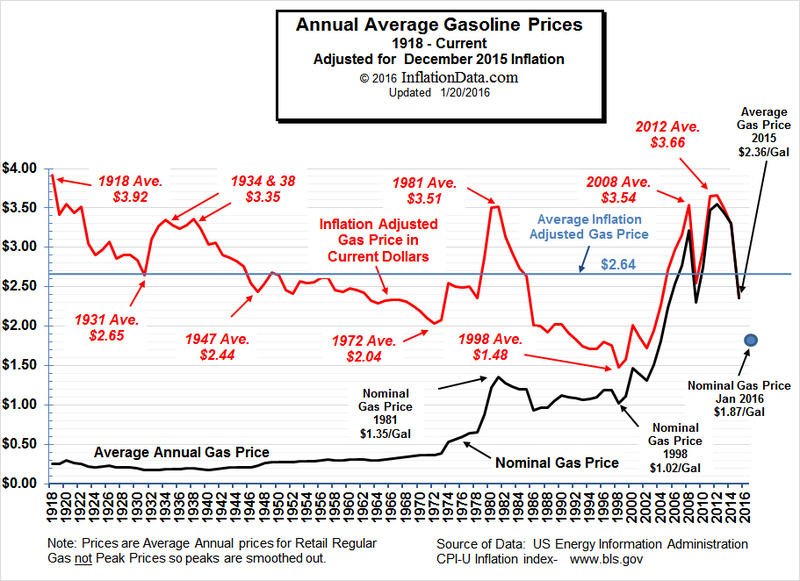 The average inflation adjusted gasoline prices since 1918 in “December 2014 dollars” is $2.64 so whenever gasoline prices were above that they were “high” and whenever prices were below $2.64 they were “low”. The average Annual gas price for 2015 was $2.36/gal so they were below average in 2015. As of January 2016 nationwide the average is $1.87/gal. so gas prices on a historical basis are very low and are nearing “all time low prices” of an annual average of $1.46. But remember to beat the record prices would have to stay below $1.46 for half the year… over the entire country. When we look at gas prices from our own personal perspective we only see a small window of 4 or 5 years at most. Rarely do we even consider a 10 year time-frame. Therefore, we might assume that gas prices “always go up.” But if we look at the big picture in inflation adjusted terms we will will get quite a different picture, as we can see from the chart above. Yes, the black “nominal price” is always rising but in inflation adjusted terms gas is currently below average. Except for a few short term spikes, gas in inflation adjusted terms, was actually trending downward from 1918 through 1972. Which is to say that the cost of living based on other things increased in price more than gasoline over that period. From 1972 through 1981 prices moved up sharply, and by 1980-81 everyone was suffering from sticker shock as nominal gas prices rose above $1.00 for the first time but then it continued its downward trend. From 1970-1980 gasoline regained almost all it had lost over the previous 50 years. Then from 1980 – 2000 gasoline fell to new lows on an inflation adjusted basis. But then from 2000-2012 gasoline caught back up with other prices and was back where it was in 1918. From 2012 through the end of 2015 average annual gas prices have fallen from peak levels down to below average and January prices are near an all-time low. How about showing gas prices without the taxes compared to your nominal price? Gary, Is Gasoline Taxes by State what you are looking for? Could you make or show a chart comparison true cost of living since 1900-2017 and cost of gasoline and other things a modern American cannot survive without buying. Maybe even add in or make another chart showing Min Wage inflation adjust what it’s worth now and then, maybe compare it to Median Income to show the true destruction of America which started in the 1990s and will NOT end. Thanks for the comment. Over the years we have done comparisons between the cost of living 100 years ago and now. Like Food Price Inflation Since 1913, Its Weight in Gold: The Real Prices of Things and The Real Basket of Goods. Hope this helps! Ronald Reagan saved us from Jimmy Carter. Thank God for the Gipper! Would be.nice to know how many industrial plants their was then and now. Might be surprised to know that their aren’t any new ones that I know of. Since at least 1990 when NAFTA was signed manufacturing jobs have been moving overseas. We began shifting toward Computer based jobs so it is misguided to count “industrial plants” since they are no longer the basis of our economy. We have left the industrial age, passed through the information age and are now entering the post information age. But in answer to your question what about all the plants Elon Musk is creating, Tesla, and the “Switch data center” which covers a massive 6.5 million square feet? Space-X? Powerwall? SolarCity? That’s just Elon. How about all the projects by Bezos, Page, Adelson, Ellison, Gates and don’t forget Steve Jobs. I don’t know where you got your prices from, but, when I was growing up I can remember when the gas prices fell from $0.17 a gallon to $0.07 a gallon in the late 1950’s. In the mid 1960’s It only cost $2.00 to $5.00 to fill up your car and the tanks at that time were between 20 gallons to 25 gallons. Would be interesting perhaps to create a “cost of driving” index for motorists (or for truckers, using diesel price); the index would relate US avg. gasoline price to avg. fleet fuel economy, and would show “miles per dollar” …. But should it count just marginal costs (gas, tires, oil) or Average Total Costs (including depreciation, insurance, licensing fee & taxes)?